Today, IT’s customers are more mobile and global than ever before and as such expect their applications and data to be available 24x7. Interruptions, whether planned or unplanned, can have a major impact to the bottom line of the business. 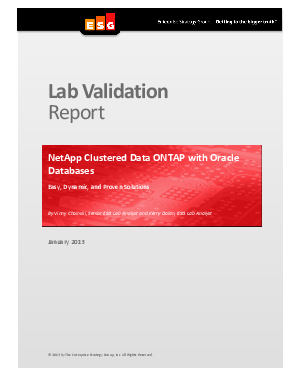 ESG Lab tested the ability of clustered Data ONTAP to provide continuous application availability and evaluated performance for both SAN and NAS configurations while running an Oracle OLTP workload. Check out this report to see the results.